When Jesus told his small band of followers that they would make him known to the ends of the earth, he unleashed a socio-spiritual revolution that continues to change our world today. And the message they would carry was that as we learn to love God, love our neighbour and love ourselves – in that order – a new community of grace and truth is possible. These largely uneducated and insignificant disciples never conceived of this mission and the community it would produce as being possible apart from a living encounter with the words and very reality of Christ himself. On Monday, Tim Flannery released his new book Here on Earth: An Argument for Hope and some of what he proclaims sounds eerily similar to the mission proclaimed by Jesus, but with a new god at its core. An extract from the book appeared in Saturday’s Sydney Morning Herald under the heading, ‘To the ends of the earth we must go’ – either an accidental or deliberate recalling of Christ’s words. And while the focus of the extract is human responsibility for causing – but also potentially repairing – environmental degradation, there is a deeply spiritual tone to the article. ‘Beckoning us towards destruction are our numbers, our dismantling of Earth’s life-support system and especially our inability to unite in action to secure our common wealth. Yet we should take solace from the fact that, from the very beginning, we have loved one another and lived in company, thereby, through giving up much, forging the greatest power on Earth. Flannery points to a beginning where love and community were present and that this trait has meant that unlike many species, we do not destroy our weak but through working together, even the weak find triumph. 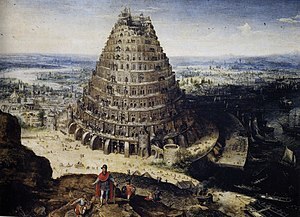 Flannery is bringing two timeless themes together – the ‘tower of Babel’ which sees humankind come together in a godless unity to save the world and the ‘love is all you need’ scenario in which our loving nature will save us. In comparing the two missions – that of Jesus 2000 years ago and Tim Flannery’s today – we see similarities and differences that are at the very heart of the moral, spiritual and ethical dilemma of our time. While action to protect, sustain and repair our environment is a certain mission for our generation and beyond, on its own it’s yet another modernist utopian vision doomed to despair. Humanity has certainly been given many great resources to care for our world but they will never overcome the cracks and imperfections of our beings. And despite our best effort to paper over this with a shallow form of human love, we lose all value in materialist world where the environment is god. We must eventually recognise that the power of human relationship that Flannery rightly points too, is truly found as a byproduct of relationship with a redemptive God. Without his forgiveness, restoration and righteousness we will just be more of the same and Flannery’s argument for hope will be just that. An argument, with winners and losers. Nothing more. Posted in Comment, Culture, FindingFaith, God-spotting, MediaMoments, World.Tagged Earth, God, Jesus, Religion and Spirituality, salvation, Tim Flannery. There is – and to love Him is to know Him and to know Him is to love Him.